Teck Resources Ltd. (TSX:TCK.B and TCK.A),(NYSE:TCK), one of the largest suppliers of coking coal for steel production in the world and a main exporter to China, promised on Wednesday to defer some $1.5-billion in capital it had expected to spend this year and in 2013, adding its third quarter profit dropped by more than half. Teck Resources' capital expenditures are now expected to total $1.8 billion in 2012, down from previous guidance of $2.1 billion and original guidance of $2.3 billion. The Vancouver-based miner also said it estimated coal production for the year to be around the lower end of its earlier forecast of 24.5 million to 25.5 million tonnes. "The uncertainty in global economic conditions resulted in lower commodity prices and sales volumes of steelmaking coal compared with the third quarter of 2011,” said Don Lindsay, Teck president and chief executive officer, in the third quarter results statement. “Notwithstanding our strong financial position, some of our planned capital spending has been deferred for a variety of reasons and we have also implemented a cost reduction program,” Lindsay added. The company, whose main operations are in Canada, the United States, Chile and Peru, said market weakness in the steelmaking coal market is likely to continue into the first half of next year. The main projects affected by Teck’s deferral include Quebrada Blanca (phase two) and Relincho copper projects in Chile, the Fort Hills oil sands project in Alberta and the Trail zinc operations in British Columbia. The Canadian copper, coal, lead, and zinc producer fell 2.5% to Cdn $30.54 at the close in Toronto yesterday. Its shares have dropped 15% this year. 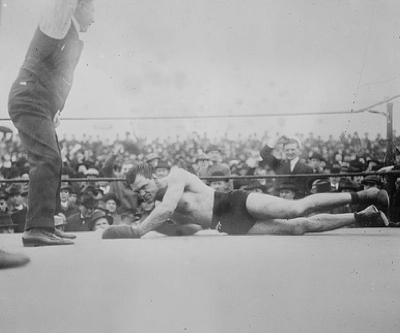 Image: Boxer Pelky knocked out, Library of Congress, Prints and Photographs Division, Washington, D.C.